This adapted version of the 1842 cadastral plan of the Isabella Quarter (from the collection of the Brussels City Archives) shows the Belliard Steps, the placement of the two buildings (indicated by the black dots) as well as the extent of the panoramic view at the level of the statue. It is possible that these crossing interrupted lines were added to the plan as a result of the debate about the two houses. The view also depended on the height of the Pensionnat. The cross shows the wide range of the panoramic view. On bright days Charlotte and Emily would have been able to see for instance Koekelberg, and surely places quite far beyond that village, if only there hadn’t been these two obstacles. 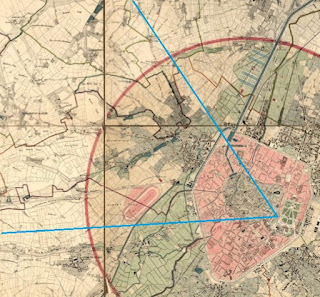 Based on the cross lines it is possible to give the range of the view to a much larger extent. 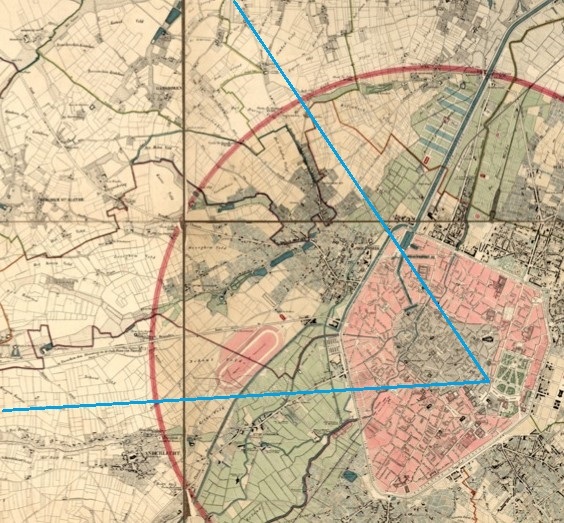 For this an 1840 plan of the city and wide surroundings was used, for the following picture, as well as an 1853 plan to get to a good estimate of how these lines would have run. 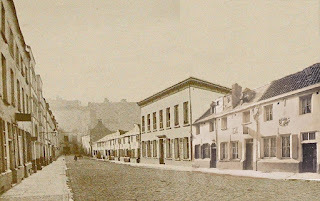 The story of these two buildings begins on 30 June 1840. 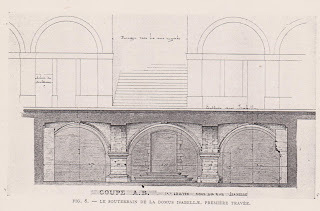 The l’Emancipation newspaper reported that the City Council had “adopted a project of embellishment and of public utility which the inhabitants would be applauding without any doubt: this project is a modification to the steps of the Passage de la Bibliothèque, which in its present state is merely a dirty cesspool,” a place where few people came because of the risk of being robbed or attacked, “a permanent home of all sorts of disorder.” This problem had become more acute following the recent unveiling of the statue of Belliard. 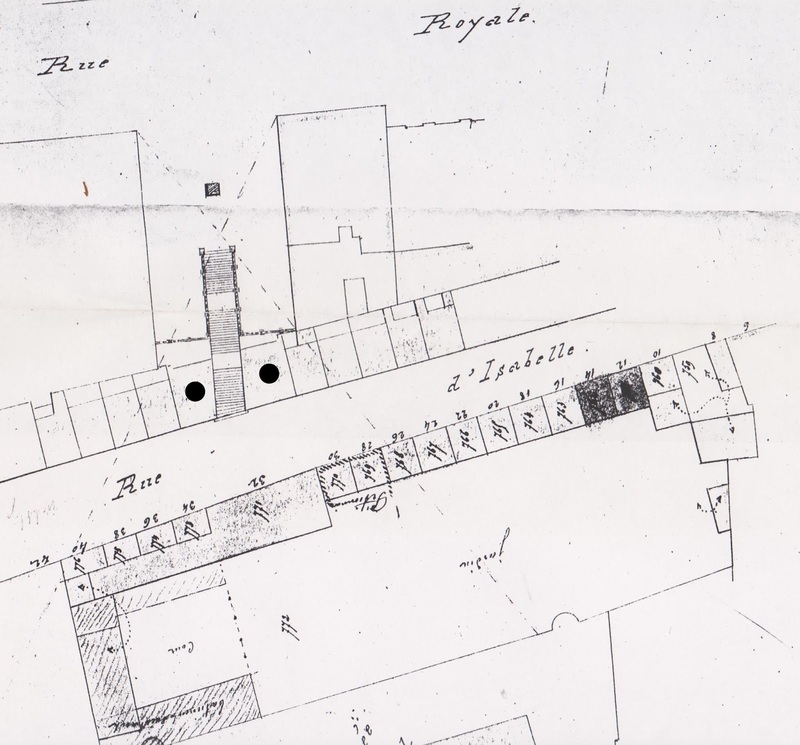 “In the rue d’Isabelle several buildings will be demolished, and part of the terrain will be used to enlargen the steps in a straight line. It will also be made less steep.” On either side of the steps two new buildings would be erected, as high as the steps. On either side of the steps, from the statue down to the Isabella Street, there would come gas lights. It is of course important to remember here that this is the place where, in Villette, Lucy Snowe on the night of her arrival in the city, first came close to the Pensionnat. But she didn’t see the steps, and got frightened by two scary men. It is an indication that in 1842 it still may not have been a very safe place, when darkness had fallen. This plan shows what Charlotte had in mind when she wrote about Lucy Snowe’s walk, to get her to the Pensionnat. It’s a great little piece of writing about the Quarter, full of suspense too. Perhaps this newspaper pressure worked. A month later (on 22 April), the paper reported that the works would soon be resumed. By the end of July they should be finished. And by then it became clear that the owner of the new houses had gone a bit too far, or rather, too high. The fine panoramic view over the city and beyond from Place Belliard had to some extent been diminished. Even people from the Rue Ducale, the street at the other side of the Park, complained (l’Indépendant, 23 July). Before the petition, mentioned above, the city had already started a court case against the owner of the two buildings. On 3 February the newspapers reported that the city had won the case, but only at the level of the ‘Second chamber of the tribunal of 1st instance of Brussels.’ On the 9th l’Indépendant wrote in more detail about the verdict. 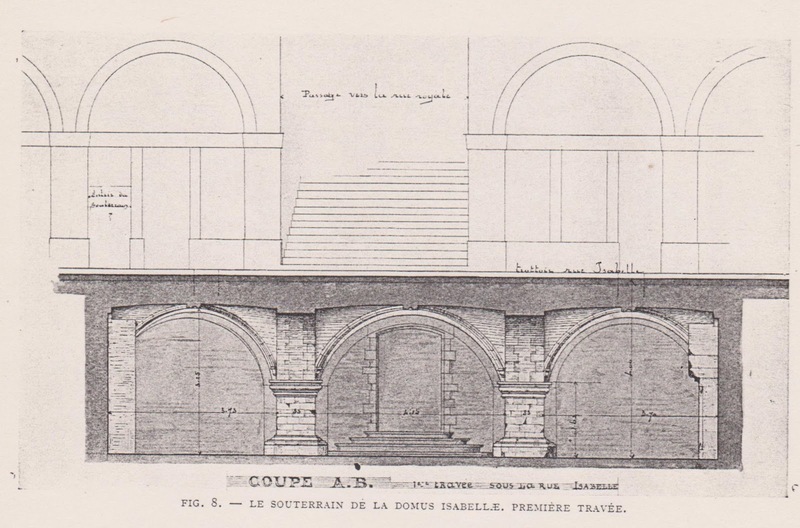 Based on a ruling of 16 November 1796 the tribunal had decided that the buildings should be lowered by 1,75 meter, within a month of the “signification du jugement.” The agreement of 30 June 1840 was annulled. Still, nothing happened. The fact that they were deemed 1,75 meter too high gives some indication to what extent the panoramic view had vanished. It’s more than most people’s heights at that time. Still, it says little about how much really the view was affected. We do not know if one could still see part of the city, or where otherwise the view would begin, or even if any panoramic view was left. At one point there was the suggestion to make the roofs of these buildings platforms for enjoying the panorama, as a solution of the problem. The owner of the houses, Monsieur Hauman, still must have a good case in his defense. 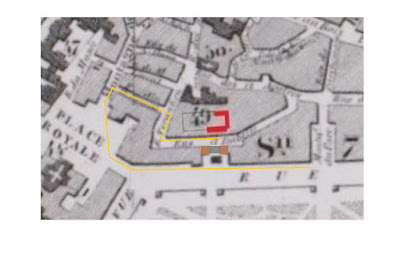 The city must have made some mistakes in the wording of the contract of June 1840 between them, regarding the height of the two new buildings. It is likely that he said he would appeal. On 22 March the papers announced that there would be negotiations, a signal that the city did not have that much confidence in the case. These negotiations were to result in a very generous amount of compensation money for Haumann, it was said, but the sum was not revealed. In the deal the city bought the houses. The story of the boys who got arrested for playing in the souterrains of the buildings (see the entry for the 21st in the April Calendar) shows that after all this time the buildings were still not finished. No such thing would have happened had people already been living there. This cellar was rather old and very interesting. They were the remains of the Domus Isabellae, built in the early 17th century. In the middle of this building the history of the steps had begun. 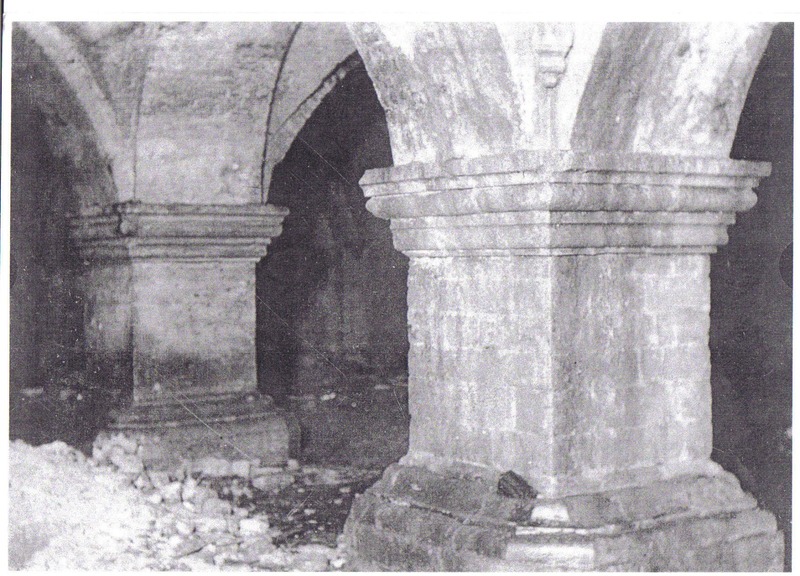 The cellar survived until 1910. 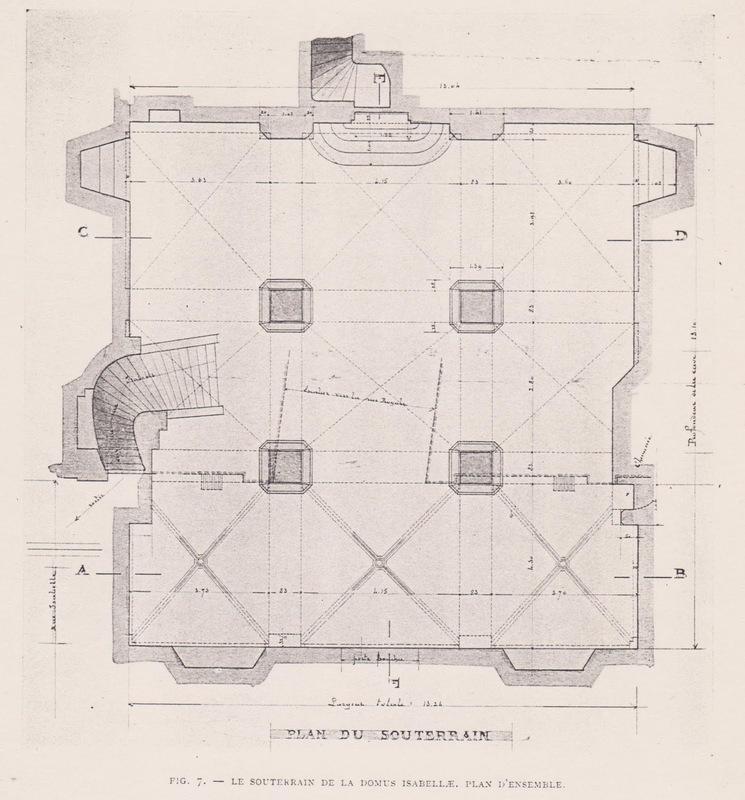 It is still given as one room in an archeological drawing published by Victor Tahon in his monumental La Rue Isabelle et le Jardin des Arbalétriers (Brussels 1912), with the beginning of the steps. The pillars in this cellar make an impressive sight. In later times the Hégers were said to store their pear harvests in this cellar. 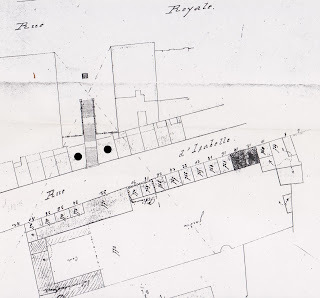 On 27 August 1842 l’Indépendant wrote that workers had begun to “demolish the upper part of the two buildings.” The Journal de Bruxelles wrote on 11 September that they were actually demolishing the entire buildings. By the time the sisters left it was an empty space again. The old pictures of the Belliard Steps which we know are therefore clearly not the way Charlotte and Emily saw them in 1842. The BBG blog will of course keep you informed about any new developments in 1843. 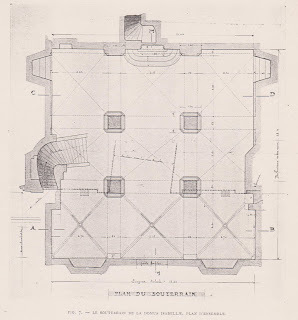 The 11 September article also mentioned that “one assures us that the roof of a building situated on the other side of the rue d’Isabelle, will be transformed into a platform; the public can’t but approve of such a work, which opens up a much better view of the landscape, of the city below.” That building must have been the Héger Pensionnat. 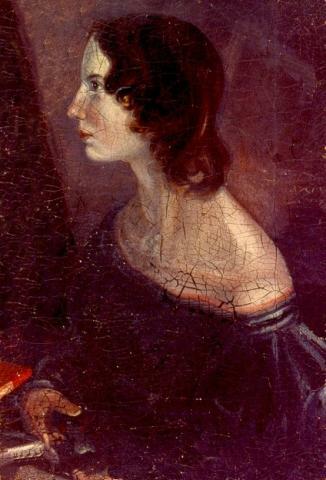 It will have been part of the works that took place more or less while Charlotte wasn’t there. 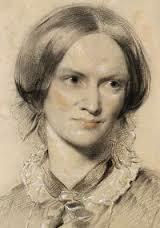 When she came back at the end of January 1843 she found the building had been enlarged (according to Mrs. Gaskell). In the next article there will be more about the panoramic view, the Pensionnat and the street.